Is he reading his speech from his smartphone? 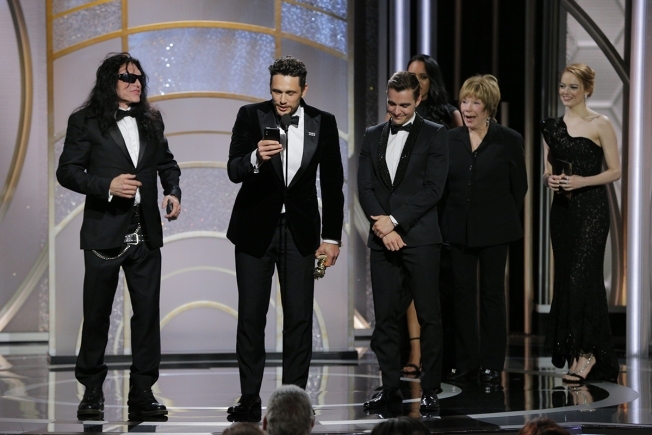 James Franco, with Tommy Wiseau and Dave Franco, accepts the award for Best Performance by an Actor in a Motion Picture – Musical or Comedy for “The Disaster Artist” during the 75th Golden Globe awards. James Franco took what was arguably the worst performance in movie history and turned it into what was arguably his own greatest role, taking home a Golden Globe on Sunday for "The Disaster Artist" that puts him on the inside track for an Academy Award nomination. "First person I have to thank is the man himself, Tommy Wiseau, come on up here Tommy!" Franco shouted when he accepted the award. Wiseau darted out of his chair, ran across the room, and leapt up to the stage with his long, dyed-black hair and sunglasses looking, as Franco's friend and co-star Seth Rogen described him earlier in the show, "like Johnny Depp went to a costume party dressed as a vampire." Franco's remarks were as much an acceptance speech for Wiseau as they were for Franco himself. 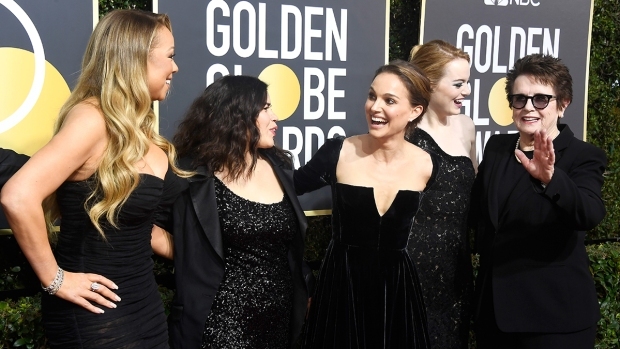 "Nineteen years ago he was stuck in traffic and saw a sign for the Golden Globes," said Franco, who then broke into Wiseau's mystery accent as he did in the film. 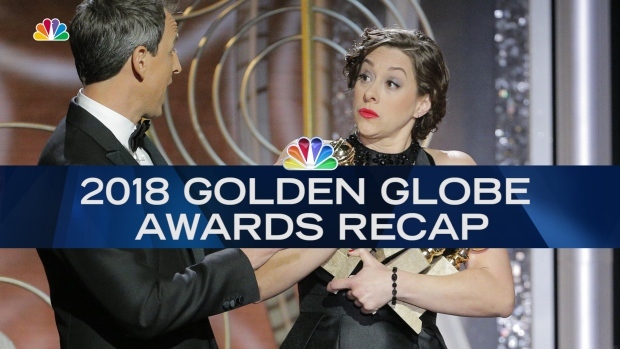 "Golden Globz, I don't care, I'm not invited. Guy with long hair, accent. So I show them. I don't wait for Hollywood, I make my own movie." Wiseau was among the most popular partners for celebrities posing for photos on the red carpet Sunday. Franco, 39, a clear but not overwhelming favorite in the category, beat out fellow nominees Steve Carell for "Battle of the Sexes," Ansel Elgort for "Baby Driver," Hugh Jackman for "The Greatest Showman" and Daniel Kaluuya for "Get Out." It was Franco's first Golden Globe for a film role in his third nomination in the movie categories. He won a Golden Globe playing the title character in the 2002 biopic "James Dean." His one previous Oscar nomination came in 2011 for "127 Hours." The 39-year-old Franco later shifted to earnest in his speech, saying the movie was a sincere story of friendship, thanking Rogen and his brother Dave, who co-starred as his best friend in the film. "I used to want my own Coen brother, someone to collaborate with," James Franco said. "I realized I had a Franco brother. Thanks to my mother for giving him to me."